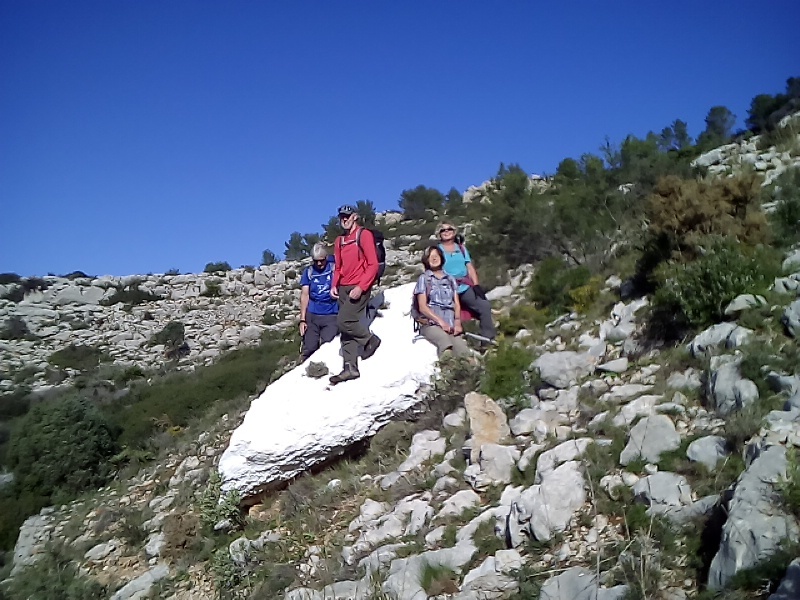 Our site is dedicated to the documentation of mountain walks in and around the Costa Blanca region of Spain. Our maps are the most up-to-date available and are continually being updated. View our WALKER'S DICTIONARY for clarification of terms used. MAKE SURE YOU UNDERSTAND BASIC TERMS (path, track,col,etc). A compass is sometimes necessary to follow walk instructions. Click on photo (or map) to enlarge view. is sometimes too difficult to describe in writing what is a slightly better route to follow. All times quoted are walking times only and include no break time. These times are quoted to help gauge distances between reference points. have a coffee/banana brake, add approx. 30 % to arrive at a total walk time. Walk descriptions now show % of walk completed based on walk time. Regardless of your speed, this should give you a good idea of where you stand overall. If you have been walking for 3 hours and you have reached the 50% mark, you still have 3 hours of walking left. Think before printing notes - the fewer pieces of paper you carry on your walk the better. edge of sheet. Also get in habit of referring to map when in doubt. Don't overstep your abilities. Walking in Spain can be dangerous. DO NOT LEAVE VALUABLES IN CAR(S). PLEASE LET US KNOW IF YOU HAVE ANY PROBLEMS FOLLOWING OUR WALKS. Rating walks is difficult to do as each term means different things at different fitness/experience levels. We recommend you start with a walk rated as E or M to understand our rating criteria. W WALK IN THE PARK: A new category for Sunday walks for anyone, maintained normally by municipalities. E EASY : Less than 4 1/2 hrs. and less than 200 Mtrs. ascent. M MODERATE : Less than 12 Km and less than 400 Mtrs. ascent. MS MODERATE / STRENUOUS : More than 12 Km and less than 600 Mtrs. ascent. S STRENUOUS : More than 15 Km less than 800 Mtrs. ascent. VS VERY STRENUOUS :More than 20Km or more than 800 Mtrs. ascent. SCR SCRAMBLES: This implies the need for handholds to ascend/descend steep rock pitches which could include exposed sections. THE SERRELLA RIDGE is our favorite walking area. 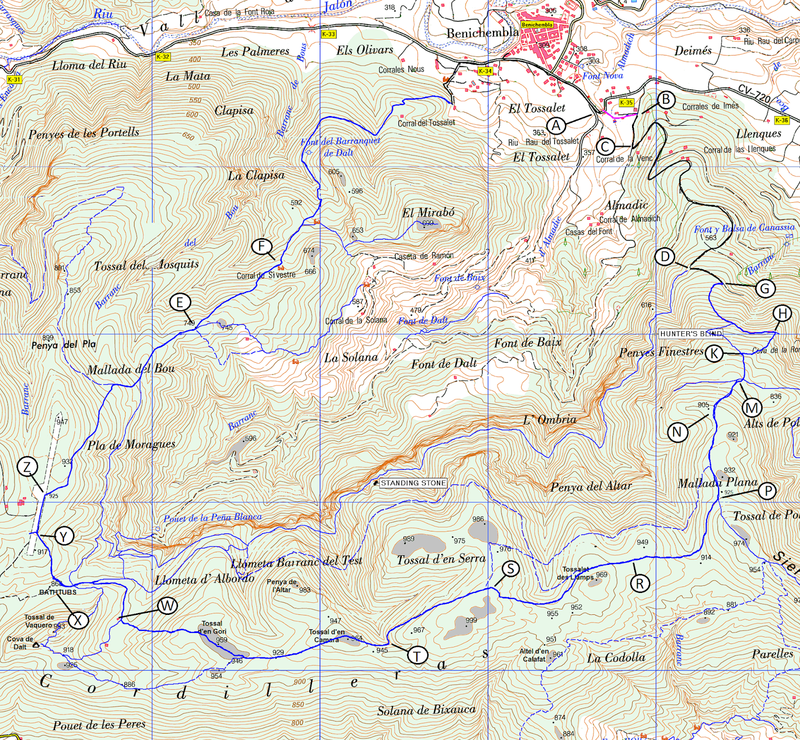 Walks including Pla de la Casa,Malla del Llop, Facheca/Famorca circuit, and The Ghosts among others are all must dos. The ridge end to end is a fabulous walk, certainly worth the car shuffling necessary. Allow 9 hours to be on the safe side. It would be worthwhile to bring along some of the mentioned walks as rescue points in case of bad weather or sore muscles. THIS WALK brings you through the eastern tip of the Aitana range along long forgotten old tracks and paths, through secluded valley and up a 45 minute scramble to summit of Penyo Roc, followed by a leisurely return to car(s). 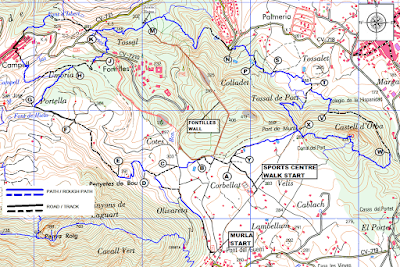 If you have already done the Cordillera Ledge walk (a must walk) this walk is a good follow-up. Rather than walking along the lower ledge, this walk rises to the summit for a four kilometer of ridge walk before descending and returning to Benichembla via the Cocoll air strip. 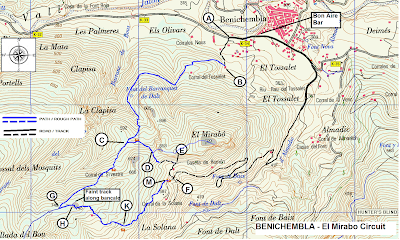 Starting from Benichembla it begins with a very steep 45 min. ascent by road and very rough tracks. Most of the ascent is at the beginning of the walk. Some of the times and distances have been estimated and will be confirmed a later date. Caballo Verde Ridge : often referred to as the "Caball Vert" ridge. 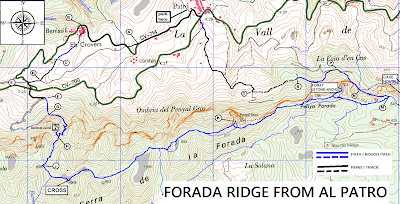 According to the map the real name is the Sierra del Penyo Roig (Range of the red rock) The Caballo Verde is actually the eastern most part of this 6km long ridge); also called the "Serra del Penyal de Laguart"
An easy walk with one main ascent. 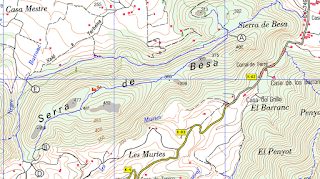 The ascent reaches the ridge of Serra de Besa. Except for the short distance at beginning on track, the rest of the walk is all on excellent path greatly improved in 2019. 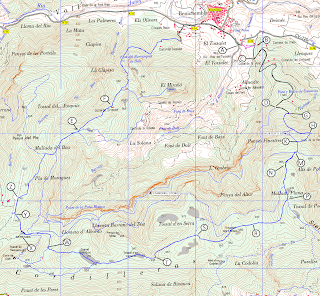 Walk can be lengthened by starting in Jalon - Just follow map. castle of Benissili. The ridge passes by (and over for the brave) a forat (hole through the mountain) and (as an extra detour) a visit to a cave house. 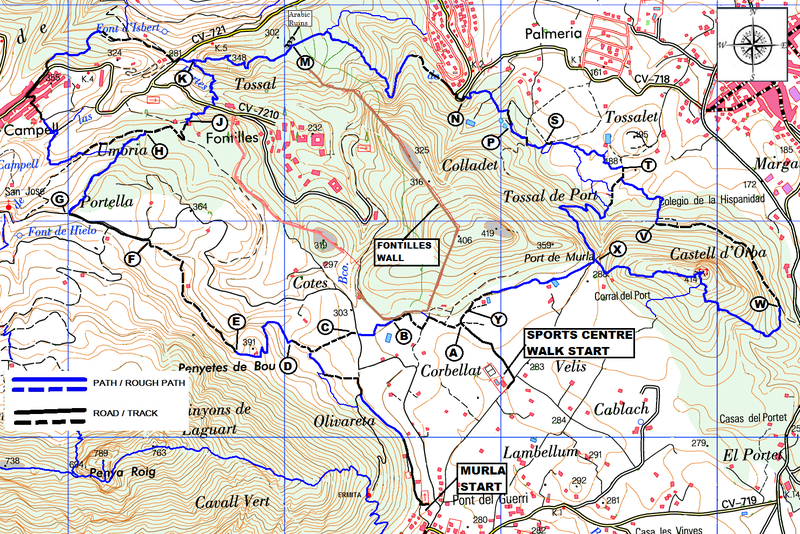 A moderate/ strenuous walk mainly on good tracks and paths with one unavoidable steep scramble. Not all the paths are well marked so some path finding skills are necessary. The route takes us around the interesting Fontilles leper colony, founded in 1902. This is a peaceful, spiritual place that warrants a separate visit. There is an information centre on the grounds. The first scramble takes us up the little tossal north of the Fontilles centre. The climb rewards us with spectacular views of the colony buildings and the impressive wall that encloses them. The longer version (14km. 700Mtrs) includes trap to Campell and climb to Orba castle. Decisions as to which version to take can be taken en route. The shortest route is 9.8Km. Sports centre-Fontilles-Sports centre: 9.8Km. 410Mtrs. This challenging walk has many interesting features. The start with 1 ¼ km walk on lovely path beside the sea to cave down at water level (side trip down and/or view through hole from top). This is followed by a grueling walk up steep, good paths, then an easy flat stroll across the Plana to the remains of eleven windmills, previously used to grind wheat. An optional return path follows, but the best part of the walk and its’ major raison d’être would be missed if you don’t continue to the Eye of Montgo, quite a strenuous climb but worth the trouble. Starting with a riverbed walk of 1 ½ km, over Col de Gaga and return via a mix of mozarabic trails and interesting riverbed. Due to overgrown sections, may be difficult to follow. Shorts are not recommended. Best done using GPS track as some ways are a little vague. and the GPS track for use by those who use a GPS. This 13.5Km. 460Mtr. Walk is not difficult, no scrambles, but very much worth the walk. with a bit of rough (new) paths. on the way up and panoramic views of surrounding mountains from the Tossal summit. of exposure but are quite simple for experienced walkers. Due to a herd of bulls frequently creating new paths, the correct path to go from G to H on the map may change. A moderate walk mainly on good tracks and paths with one unavoidable steep scramble. Not all the paths are well marked so some path finding skills are necessary. The route takes us around the interesting Fontilles leper colony, founded in 1902. This is a peaceful, spiritual place that warrants a separate visit. There is an information centre on the grounds. The steep unavoidable scramble (with good foot and hand holds) takes us up the little tossal north of the Fontilles centre. The climb rewards us with spectacular views of the colony buildings and the impressive wall that encloses them. WALK SPECS: DISTANCE 10.2 km. - WALKING TIME 3 hrs. ASCENT 420mtrs. GRADE M Scr. This is an extended version of our Castell Granadella Circuit. It starts at Cumbre Del Sol, elevation of 190 meters, with a pleasant flat track walk before descending on a surfaced (concrete) track to reach the costal path. ( Although we prefer to avoid surfaced roads this one is all downhill and offers the opportunity to focus on the superb views instead of our feet.) The beautiful costal path is a little exposed in places but a couple of chains have been placed to aid the walker. A side trip to visit the ruins of Castell Granadella (a horseshoe shaped building, which was once part of the Valencia Costal defence, that dates back to 1739) is followed by a steep climb to the Mirador de Levant. After this rather arduous climb we descend once again first by track and then a nice path to reach the bottom of a Barranco . A long stretch along the barranco floor before a sting-in-the-tail climb out and back to our outward track. A moderate walk with two main ascents. The second, more difficult of the two, can be avoided by taking the indicated short cut making an easy version. The walk across the ridge first offers fine views of the cultivated Jalon area and then the beautiful secluded area of Les Murtes. The second ascent follows the Barranc Murtes to a small delightful hidden valley. The ascent of Talai (optional) is a new path (2014) and therefore rough, but worth the climb. Then on to the Coll de Rates. The descent from Coll de Rates is via the Camiano de Xalo a Tarbena. In days gone by this was a major route but nature has taken its course and now looks more like a path. 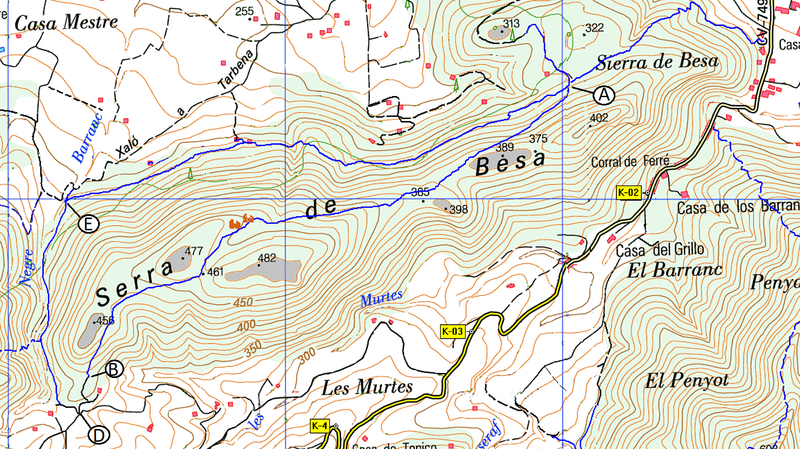 We leave it in favour of a very nice path below the ridge of Serra de Besa back to the start. 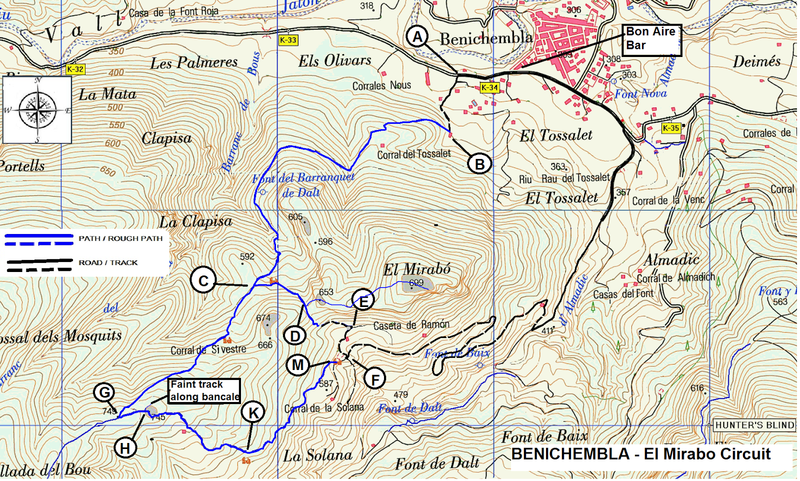 This exciting walk combines part of the well know Bernia Circuit route with the ascent of the west summit. Our version of this walk starts at the Bernia Restaurant. Although a shorter walk than our Bernia West Summit Circuit, this walk spends more time walking the ridge and requires a bit more care and skill. Part of the way (from A to B on map) is very rough steep scree. The best way across the ridge to the west summit is waymarked. The ridge traverse is exciting and involves a few interesting scrambles, the toughest of which are now made easier with the aid of chains and ropes. Reaching the summit is rewarded with extensive views and a sense of accomplishment. The descent, however, is not a walk in the park. It requires more scrambling with chain and rope followed by a steep, often loose surfaced path (more scree) back down to the Fort. Although quite strenuous, there are no virtiguous parts. The rewards are definitely worthwhile. Although walking time is only 4 hours, the views and points of interest warrant reserving 6 hours to complete walk. The views are among the best you’ll find. PLA de la Casa is the highest of the peaks which make up the magnificent Sierra de Serrella - the handsaw of mountains which flank the north side of the Guadalest valley. Seen from the valley floor they appear to be a vertical impenetrable wall of rock. But there are several routes which negotiate the ravines and slopes, making use of ancient livestock trails and paths hewn out by men who would scale the peaks to make use of the snow wells. The routes have been established over centuries and this one starts in the village of Facheca (Fageca). The climb alternates from gradual to steep but is rarely punishing and constantly stimulating. The views on reaching the narrow plateau close to the summit would melt the soul of all but the most hardened individuals. Much of the route follows the PRV- 182 path and is waymarked. For those who want to skip trip up to plateau, an alternate circuit walk is described. Starting from the landing strip of Cocoll, this walk brings you along the beautiful Cordilleras Ledge in a clockwise direction back towards Benigembla. Once there, a steep climb leads to a stretch of the Col de Rates circuit path before heading up to and along the ridge of the Cordilleras, mainly on animal paths but quite clear and ,with occasional peeks at map, you will eventually have landing strip back in view and good paths leading you back to your car(s). Good walk on well established paths with optional trip to summit of Mirabo. Just long enough to do before lunch at restaurant Bon Aire in Benichembla. Sierra Olta is a massive isolated lump of rock that is detached from the even more massive Sierra Bernia to its NW. Walking around this often-sheer rock, some 600 meters high above the sea level close by, is an impressive experience. There are excellent views of Calpe and Penon Ifach, also along the rather pretty coast towards Benidorm, and then of the Sierra Bernia. Calpe lies at its SE foot and, also being close to the main N332, the walk is easy to reach. So it is a very popular walking area with a variety of paths, well signposted. The ascent to the summit is steep but manageable. The summit is an area of fissured sharp rock and ankle-supporting boots with thick soles are essential for this. This is a particularly satisfying and interesting walk once the possible obstacle of accessibility to the start is overcome. It is a high level walk both snowier in winter and slightly cooler in summer. The non stop succession of views is superb and on a really clear day the islands of Formentera and Ibiza are visible some 100 km to the ENE. Font Tejo (Dels Teixos) is a delight, particularly on a hot day as it combines a north face, shady trees and cool water (not for consumption). A hut in which to shelter generally seems to be open and makes it a very pleasant place to wait while the less relaxed of the party climb the summit. The ascent of Cerro de Parados from here is fun and not too arduous and rewarded with vertiginous views and an optional short “ridge scramble” to the W. Subsequent visits to the nevera and Morro Blau are interesting and there is the challenge of pathfinding to and from Font Major to come. At the end the cave (ice pit?) is curious and well worth an “end of walk” push. This could be made into an easier, but still very satisfying, walk by missing out the summit and taking the shortcut described in notes. A local bar would create perfection but Castells and Tarbena are not far. This challenging walk has many interesting features. The start with 1 ¼ km walk on lovely path beside the sea to cave down at water level (side trip down and/or view through hole from top). This is followed by a grueling walk up steep, good paths, then an easy flat stroll across the Plana to the remains of eleven windmills, previously used to grind wheat. The return path passes the Torre de Gerro before returning to your seaside parking and close by bars. This is a beautiful walk along the old mule paths from Bolulla that supplied the Castle. While surfaced roads reach almost to the col below the Castle it is well worth tracing the old path which is now cut by tracks and roads but there are still four well defined sections of mule path to enjoy and the intervening stretches of road are short. At the col below the castle is the start of a there and back walk to castle on fairly rough path (where one can be found) well worth the trip at least once. The return to the bar Era includes tracks and a mule path through pine woods. Picturesque walk on mainly good paths, some a little rough, through nice barranco,interesting grape vineyard and along old track where many eras (old wheat thrashing fields) can be seen. Shortcuts are noted on map to turn walk into walk/lunch at one of many nearby restaurants. 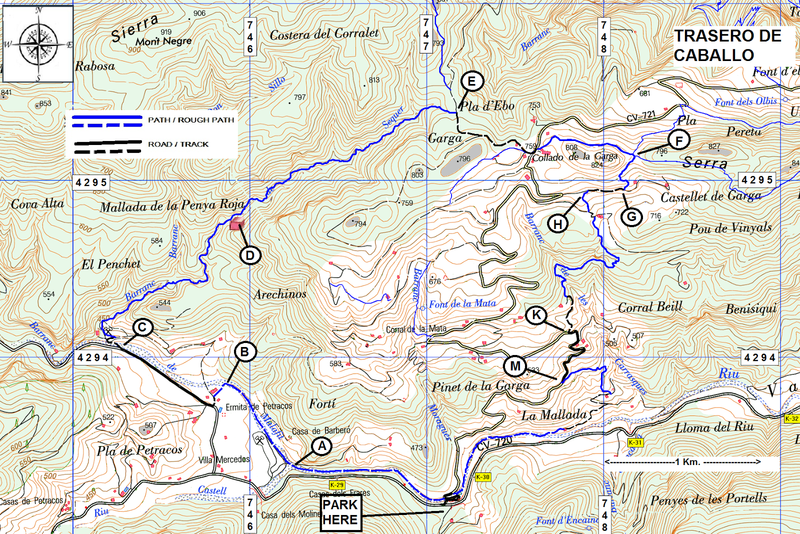 This walk starts in the valleys below the impressive Puig Campana. Then it climbs to link with part of the well known circuit of the Puig Campana but going anti-clockwise reveals different views. 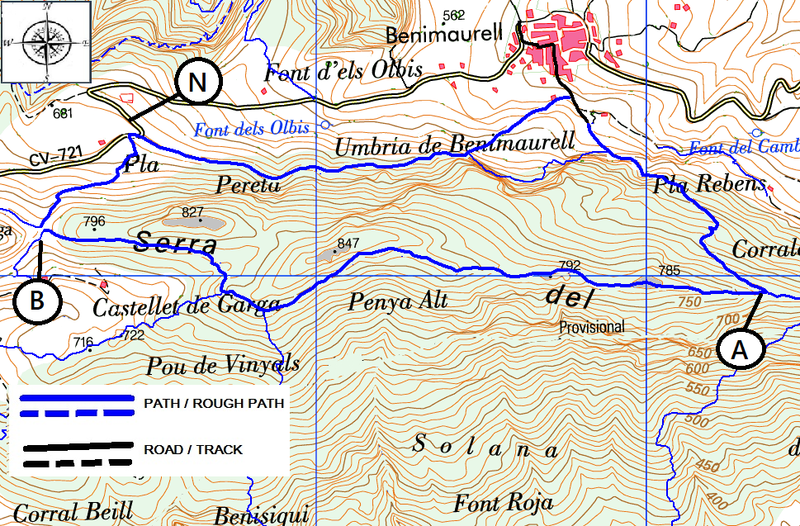 Descends again to a valley with grand views of Ponoch, circuits the Tossal del Grau and follows the charminng Barranco del LLiriret back to the start. A very pleasant walk at the foot of the Sierra Hilada in Albir on a paved wide track along the coast to the lighthouse and museum. Wheelchair friendly. Sidetrips to abandoned ocra mine for more adventurous. Approximately 4 km return. Picnic tables at start. From end of beach, take first road up. Keep bearing L and up and arrive at large car park and beginning of walk. A fairly easy circular walk, skirting Segue with its ruined Castell, then down into the broad valley of barranco Binarreal surrounded by mountains with a final climb up an old mule path. 20% fairly good paths, 40% tracks, 40% surfaced roads. Some tracks muddy after rain. As usual snips and gloves are a good idea in case paths are overgrown. FEB 2014 See comment below. Last part of walk requires snipping and is probably impassable without doing same. are the main problem area. This figure of eight walk encompasses some enchanted and dramatic scenery, a picturesque Font and two ancient mountain passes yet is mostly on good tracks interlinked by 3 rough paths and a short, but incredibly steep, mule path. It is a long walk but can be shortened without spoiling by bye-passing Mas de Sacaret. The last 1.2 km stretch of unpaved road to the start can be rough but passable for normal cars but not in, or after, very wet weather. 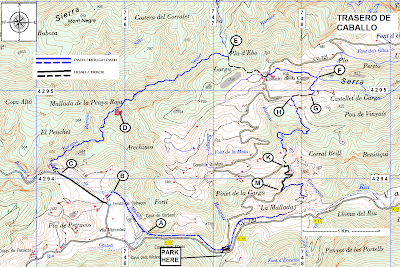 Alternatively, park at refugio and walk to start adding 2.4km to walk. Not advised after heavy rain. Good bars in Sella (Park in main car a park). An exceilent walk, certainly one of the best in the Aitana Range. A circular walk, not too hard, or long or high, which crosses the sierra and encompasses views and aspects of both sides of the range. Passing through the narrow Paso Contador , (much enlarged since the days when sheep could be counted singly as they passed). Spectacular views of the Sierras Bernia and Aixorta to the east and the Arc valley leading to Selia to the west. Soon followed by a stiff climb over the ridge of El Carrascal with a shady place at the summit from which to admire Puig Campana and Sanxet before descending into the wooded Sanxet valley with its Buddhist colony. Returning over the lip of Sanxet, (pause to take in the views), to pass below the "waterfall," (occasional), and the overwhelming cliffs of the "Habitaciones de Dios". Two different starts are described below. For large groups, a start from Restaurant Raco de Pepe is best. For smaller groups start from Almaseras is our choice. This is a pretty unique walking route, not really for the fainthearted, as the name suggests.It is also steeped in history and legend, although there is little left to show visitors of its historic past.Known as the Valley of Laguar, this area is composed of three villages: Campell, Fleix and Benimaurell,which are surrounded by other abandoned villages and ancient trails that you can cross to take you through the surrounding scenery, which is made up of high mountain walls, caves and canyons formed by the river Girona all shrouded in shrubs and small trees. The walk is difficult in terms of length (14Km.) but relatively easy in the sense that there are no steep climbs. The best bit about following this trail is ascending and descending the 5000 steps, which make the walk easier. These steps were carved into the rock by Moors who sought refuge from the Christian army of Filipe 111 during the Reconquest.This place is the last Moorish stronghold in Spain before their expulsion. The whole walk takes about 5 1/2 hours and is circular. 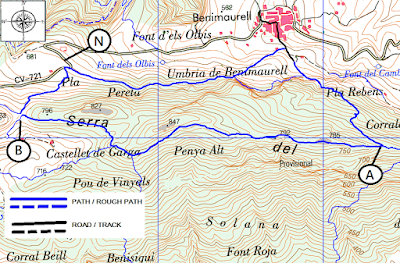 Our starting point is from the village of Benimaurell . For energetic walkers. This walk encompasses the best of both the Buddhist colony circuit and the Sanxet circuit. Passing through the narrow Paso Contador (much enlarged since the days when sheep could be counted singly as they passed). 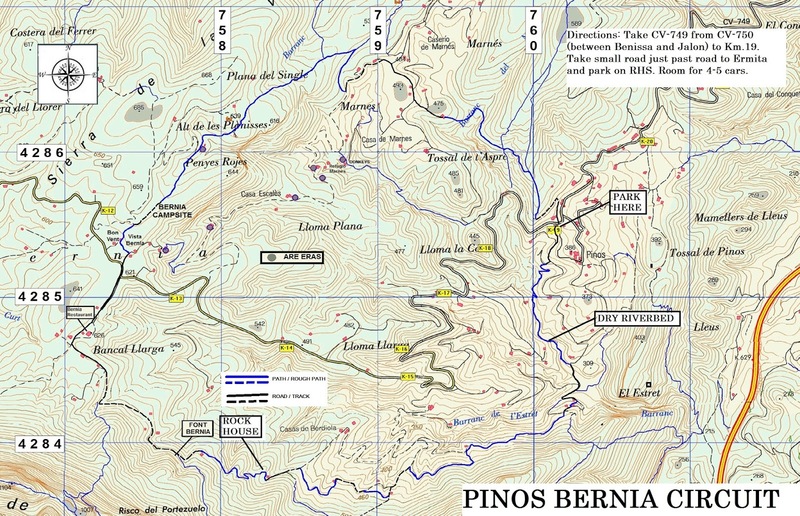 Spectacular views of the Sierras Bemia and Aixorta to the east and the Arc valley leading to Selia to the west, soon followed by a stiff climb over the ridge of El Carrascal with a shady place at the summit from which to admire Puig Campana and Sanxet before descending into the wooded Sanxet valley with its Buddhist colony. From here we go around Sanxet, passing the La Carrasca casa and around to the Casa de Dios. 70% paths. 30% tracks. Not too muddy a day or so after rain. Into a local “Grand” canyon, not quite as large, long or deep, but grand enough and similar in that you start off high and walk down low, meanwhile trying not to forget the extent of the climb back up. Starting from the remote mountain village of Benimaurell, along a charming, winding country lane to near Fleix and then down a beautifully engineered old “mozarabic” mule path, once one of the country’s main roads, to the usually dry bed of the Riu Ebo. Becoming wilder and less frequented as you walk “upstream” along a path and streambed into the ever-narrowing spectacular gorge of l Infern, finally blocked to walkers by a series of high, narrow usually dry waterfalls and pools. Then back a bit and a steep climb out of the gorge up a poor path to join another mule path, which takes you in easy zig, zags up 200 meters to the top of seemingly unscalable cliffs. From now on easy walking to Font d’els Olbi and down the surfaced road to Benimaurell and the Oasis Bar or the nearby new “walkers” hotel. 2016 WARNING: The part of the walk starting just after streambed is eroded and dangerous. If you choose to do this walk, take extra caution on this stretch. DO NOT ATTEMPT WHEN WET AFTER RAIN. 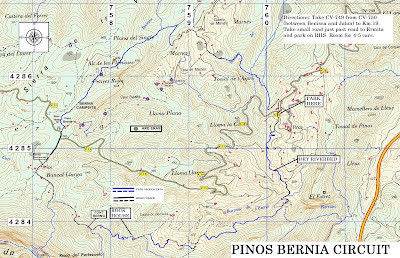 A circular walk along 80% well defined tracks from Pinos, to the Bernia Ridge back to Pinos Restaurant and up through Marnes. Good walk to practice your map reading and note following skills. An arduous walk that starts at Bolulla with a steep climb up a surfaced road offering fine view of the village. A little known old mule path continues the climb up to Foia Selles where spectacular views can be enjoyed. A short decent into the Barranco del Negra offers a little respite before climbing steeply once again to arrive just below the summit of Morro Blau. A short track walk followed by a no path, find your own way down, to below the Serra del Raco Roig. Fine views of Bollua Castle can be enjoyed from the path to El Collada. The walk ends with a relaxing walk down to Bolulla on sections of old mule paths. This strenuous but exciting walk has very little flat sections. The ups and downs are often very steep. Some path finding skills required as paths are overgrown in places and can be badly eroded. The normal approach to El Castlett (Serrella Castle) is from the North at Castell de Castells. This more dramatic approach is from the South near Guadalest. 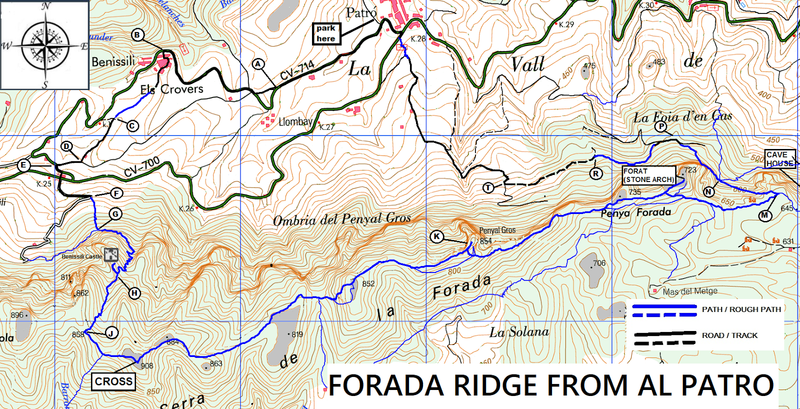 The ascent of the rugged Borranco de les Coves begins on the West side with a good path. A rock scramble brings us to the east side. This crossing is made more exciting when there is flowing water. The path continues ascending as it heads into the spectacular widening Canal of Malla de Lloup. About half way up the Canal we exit by zig zagings up the east side, affording great views of the Canal as we gain height. The very steep track leading up to the pinnacle of El Castelet can be daunting but good views offer excuses for many rest stops. The scramble up to the castle ruins (not for those suffering from vertigo) is rewarded with stunning 360-degree views. A steep decent on a partially surfaced road followed by a nice ramble on an abandoned track to return to the Barranco de las Coves where we retrace our steps back to the start.